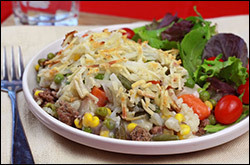 Top your shepherd's pie with crispy potato shreds -- SO GOOD! Preheat oven to 425 degrees. Spray an 8" X 8" baking pan with nonstick spray. Place frozen cauliflower and mixed veggies in a large microwave-safe bowl. Cover and microwave for 3 minutes. Stir veggies, re-cover, and microwave for 3 more minutes, or until thawed. Drain any excess water. Add soup, and stir to coat. Bring a large skillet sprayed with nonstick spray to medium-high heat. Add beef, onion, and garlic, and sprinkle with salt and pepper. Cook and crumble for 6 - 8 minutes, until beef is fully cooked and onion is slightly soft. Drain excess liquid. Spread beef mixture into the baking pan. (See HG Tip.) Evenly top with veggie-soup mixture, followed by thawed hash browns. Bake until hash browns are crispy and golden brown, about 40 minutes. Enjoy! HG Tip! Use a slotted spoon to transfer the beef mixture to the baking pan. 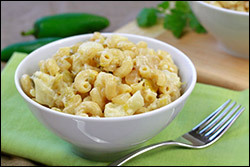 This cheesy mac is a new favorite here at the HG HQ... Try it soon! Place cauliflower in a large microwave-safe bowl; cover and microwave for 3 minutes. Uncover and stir. Re-cover and microwave for 2 - 3 minutes, until hot. Drain excess liquid. Roughly chop cauliflower, return to the bowl, and cover to keep warm. In a medium-large pot, cook pasta per package instructions, about 8 minutes. Drain pasta and stir into cauliflower. Cover to keep warm. Bring a skillet sprayed with nonstick spray to medium-high heat. Cook and stir onion until softened and slightly browned, 4 - 6 minutes. Add cooked onion, drained chiles, and jalapeño to the cauliflower and pasta. Stir well, and re-cover to keep warm. In a medium microwave-safe bowl, mix sour cream, cheese wedges, and cheese slices, breaking the wedges and slices into pieces as you add them. Microwave for 30 seconds. Stir well. Microwave for another 30 seconds, or until cheeses have melted. Stir well. Add cheese mixture to the large bowl and thoroughly stir. Enjoy! 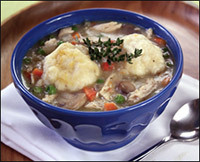 Our Hungry Chick 'n Dumpling Surprise is super yummy... But don't take our word for it -- make it and see! For major comfort food with minimal effort, click here for a trio of three-ingredient recipes -- Super-Cheesy Crazy-EZ Shepherd's Pie, "Twice-Baked" Mexi-tato, and Tuna Noodle Casse-bowl! Satisfy cravings for sweet and savory -- our Plate-Lickin'-Good Chicken & Waffles should do the trick! And for more guilt-free comfort food than you'll know what to do with, check out this page for the "Comfortably Yum!" episode of Hungry Girl. It's packed with recipes, market finds, and tips 'n tricks! Deliver these recipes to ALL your pals... Click "Send to a Friend" NOW! It's December 6th, a.k.a. Microwave Oven Day... Better check out these microwavable recipes today!